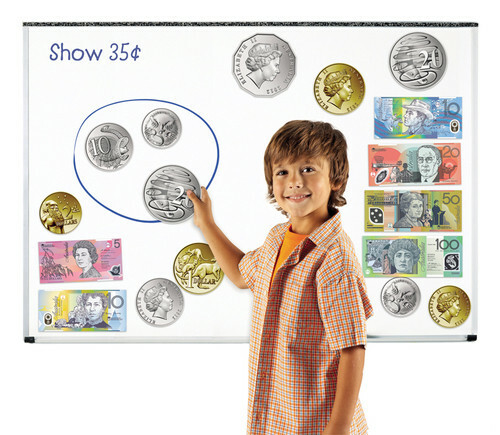 Made to look similar to real money, the demonstration sized Double-Sided Magnetic Money set is great for engaging classroom lessons. Help students to identify coins and notes, recognise the values of coins and notes, understand the value of a group of coins and notes, add and subtract money and calculate change. The Double-Sided Magnetic Money set includes 28 magnetic coins and 8 magnetic notes. Coins are four times standard size and notes are 1.5 times standard size ensuring easy viewing anywhere in the classroom and help make demonstrations a breeze! Images match our Wallet of Notes (click to view). "Bought as a gift for a teacher. Terrific for use in primary students when completing math tasks and educating them on the use of money"